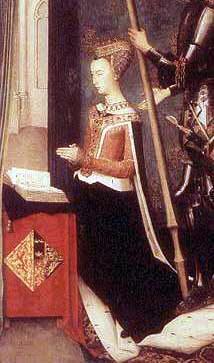 14 July 1486 - Death of Margaret of Denmark , she was Queen of Scotland from 1469 to 1486 as the wife of King James III. She was the daughter of Christian I, King of Denmark, Norway and Sweden, and Dorothea of Brandenburg. Heads of a treaty between Charles V. and Henry VIII., to the effect that they will make no treaty with the king of France for any closer matrimonial alliance than exists at present; that deputies from both sides shall meet at Calais to arrange the mutual relations of the two kingdoms; and an ambassador in ordinary shall reside in both kingdoms for confidential communication. No previous treaty to be infringed by this. Calais, 14 July 1520. Although, as I wrote on the 8th, Cromwell had given me hope that I should have audience of the King as soon as he returned from the Princess, and some good answer, not only about the negotiations for the amity, but about the assistance I demanded against France, yet I have been put off from day to day with excuses and general words; and finally, this morning they have made me another dilatory excuse, in which (to show how roundly and openly he proceeds with me, as he has continually affirmed), he told one of my servants that the delay has only been to wait for news from France, and that I had proposed to him something for the good of affairs of which he would very shortly send me agreeable news. These are the good words he has been accustomed to use, as you may know by what I have already written; but hitherto I have seen little effect in them, through no fault of his, for I believe he would be exceedingly glad to accomplish the matters, but neither he nor all the other councillors combined are able to shake the King in his opinion, or to persuade him of anything if he has not declared his fancy therein, otherwise he looks upon them with suspicion; and even when he would like it, he will do nothing, as Cromwell has several times given me to understand. I cannot imagine what those here have invented for the good of affairs, nor what news they can await from France, except those of which I wrote before to your Majesty, viz., that the French king should ally himself with them against the Pope, against whose authority they continue to do the worst they can. Even lately, when news came of the bull of the Council, they passed statutes that no one should hold the convocation of the said Council good on pain of being considered a traitor. They have also renewed and aggravated the statutes against those who should use the name of Pope, which is also treason; and it is said they will cause the whole realm to be sworn again, in confirmation of the statutes against the Holy See, against the marriage of the late good Queen and the legitimacy of the Princess, to whom no one should dare give that title on pain of his life. Moreover, on the arrival here, 10 days ago, of the Bishop,who has been some months in Saxony, there has been a proposal in Parliament to reform the state and ceremonies of the Church after the fashion which prevails in Saxony; to which the said Parliament would not as yet consent. By these things you will see their abominable obstinacy. It is to be suspected that, unless they hoped for favor elsewhere than from your Majesty, they would not continue in such disorders; and it is to be feared that the stings of their own conscience and dread of punishment from your Majesty make them the less desire your prosperity. Three days ago the French ambassador told an honest man, who reported it to me, that he had great fear of the ruin of the King his master, both from the great forces of your Majesty and for other causes, especially that the said King was hated by his nobility, seeing that he took no account of any but the Grand Master and the Admiral, by whom he was led into enterprises so rash that there was scarcely a lord or gentleman in France who had not lost some of his relations in them, or met with injuries in them himself; moreover, the French people were so oppressed that, knowing the happiness of your Majesty's subjects, they began to murmur greatly, especially as the season (la saison) this year "sera fort petite;" further, the ambassador said that the French might console themselves with one thing, that they should have the English as companions of their misery, for they would be punished after them. 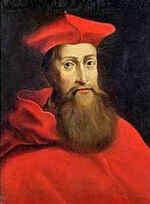 The King has news that the duke of Holstein (Duc Dolstet) his ally, has taken a castle (fn. 6) on the frontier of Norway, which was held in his name by a captain of Lubeck, (fn. 7) his pensioner, at which I understand the King is extremely displeased. I shall not omit when opportunity offers to represent to him that and other injuries to draw him over in favor of Duke Frederic Palatine, to whom he shows good inclination. 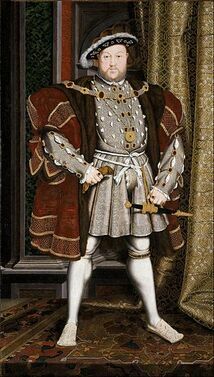 Cromwell has always told me that when matters have been set right between your Majesty and the King, he would be glad to show all favor to the said Duke Frederic. Three days ago Cromwell sent to me by one of his principal servants to beg that I would not take ill the delay of the audience I had asked, which had been owing to a mass of business, and at the same time to mitigate the blame, he informed me that next day he would get the King at my request to deliver the bishop of Llandaff, the late Queen's confessor, from prison, where they pretended that he might be kept for ever, simply for attempting to escape from the kingdom without the King's leave. He also intimated to me that next day he would send to tell me some good news touching our negociations, and moreover would request me, on the part of his master, to do something for him. But he forgot everything except about the bishop, whom he caused to be brought to me by those who kept him; to which I attach the more importance, because I had never spoken to the King about him, nor even to Cromwell, except lightly, for several reasons. London, 14 July, 1536.